This is the view as you walked into the doors of the exhibit space at the Armory on Park Avenue in NYC. 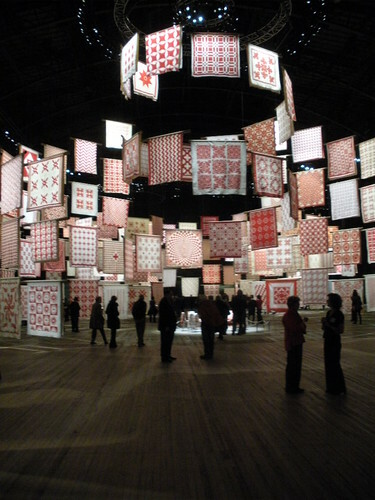 It was the most inventive, creative, AMAZING display of quilts I’ve ever experienced. If you have an iPad or an iPhone, the American Folk Art Museum has a pretty nice (free!) app in which you can look at all the quilts–I installed it on my friend’s iPad … the iPhone version is apparently still hung up in the app store. If you have an iPad/Phone/Pod, you want to search for Infinite Variety in the iTunes store. If you have emailed me or left a comment over the weekend, about author privileges or the April block, I will get back to you soon. Sophie – I can't get to your blog via your link – it's been hijacked by some other site and keeps sending me to other questionable sites. You might want to look into this. I updated the link and it seems to be working this morning. I must have typo'd the URL last night (or else the hijacker was otherwise dealt with). I was really tired by the time I got home … and just wanted to post that if you've emailed me over the weekend, I'd be getting back to you soon (which I completely forgot to say in my post–editing it now). Sophie, this picture is just amazing! Loved reading about it on your blog too! NYC is NOT one of my favorite places, but I would love to have gone there to see this! What an amazing display – I would have loved to have been there – thanks for the great pics. Sophie….what a lucky lady you were to see these quilts up close and personal!! Wow, what a treat for you!! for a while but I could get some of these blocks made by noon tomorrow…that is Texas time right?